Ed. 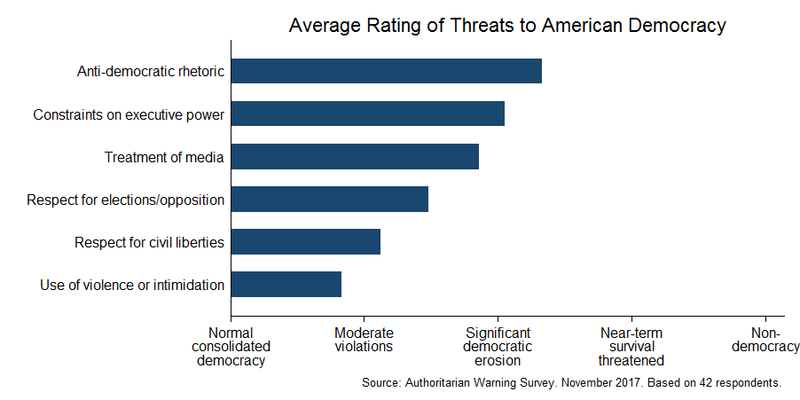 Note: An update from our partners, the independent experts at Authoritarian Warning Survey who support the Democracy Threat Index. Our November 2017 survey results demonstrate sharply rising concerns about American democracy over the past month, especially regarding treatment of media and executive constraints. From October to November, ratings worsened on every dimension except civil liberties, continuing the declining trend from September. Further, democracy experts still see American political behavior in 2017 as firmly outside the norm for consolidated democracies. On average, experts rate a 10.5% chance of democratic breakdown in the U.S. within the next four years. 86% of respondents believe that democratic quality has declined over the last 10 years. 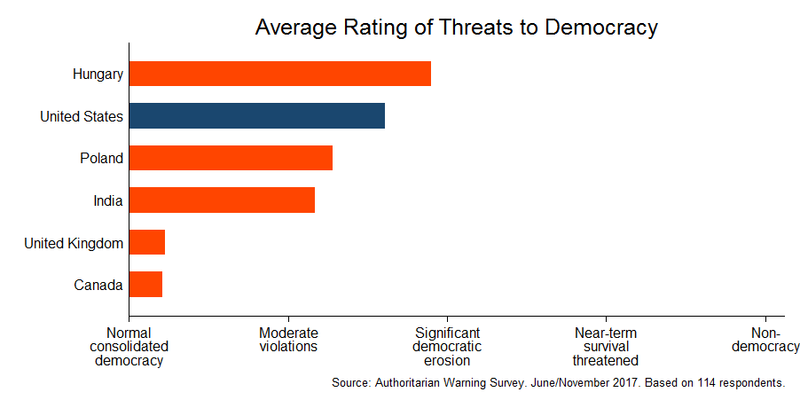 From May through November, we polled 375 democracy experts on threats to American democracy. We previously asked respondents once a month. November is the fourth month after fully switching to a daily-updated rolling survey, although we will continue with our monthly update posts. See here for a longer description of the survey methodology and sample, including our attempts to limit ideological bias. As a useful set of comparisons, we also asked the same questions about five other countries: the United Kingdom, Canada, India, Poland, and Hungary. Separate experts were chosen for each country, with a total of 71 respondents. As of November, the U.S. rates worse than India and Poland on threats to democracy, and is fast approaching Hungary. Results indicate sharply rising concerns in November compared to October, with average threat ratings increasing in five categories. The U.S. now averages above India and Poland in democratic threats, and is fast approaching the estimated threat for Hungary. 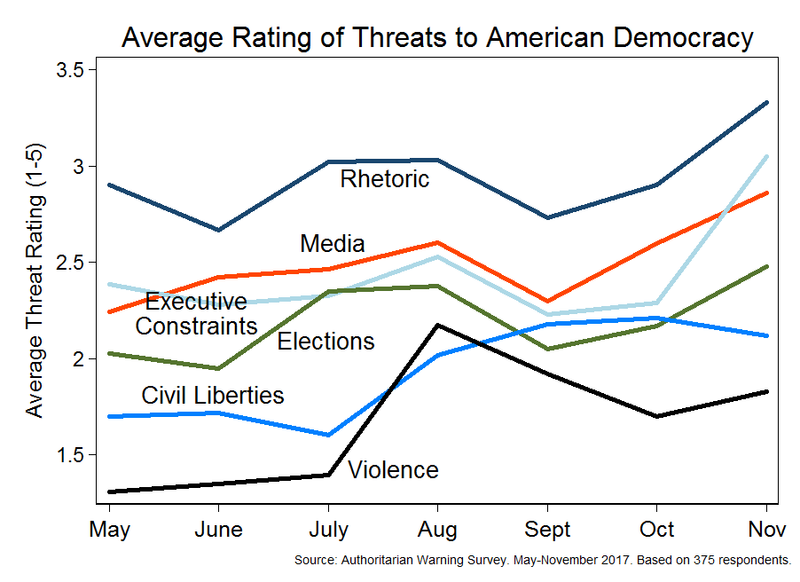 Most worrisome are the rising threat ratings for media treatment and executive constraints, which now average in or near the “significant democratic erosion” category. From September to November, the percentage indicating treatment of the media in the U.S. shows significant democratic erosion rose from 35% to 64%. The above figure shows the average rating for each category from May to November. For comparison, the overall average for India is 2.17, Poland is 2.28, and Hungary is 2.90. The two-month increases for rhetoric, media, and executive constraints jump out. In contrast, concerns over civil violence have declined with time from Charlottesville. Average predictions for democratic breakdown have generally held steady from July to November (10.3% to 10.5%), as well as the number indicating democratic decline over the past 10 years (about 85%). Constraints on executive power represents the next greatest source of threat, with one respondent warning of “ongoing threats to media and judiciary, lack of political will to hold officials accountable, [and] lack of civilian oversight over the military.” Another warned of “unchecked state coercive powers; rhetoric regarding the criminalization of opposition.” Executive power also represents the largest rise in threat since September. Close behind are treatment of elections, with continuing concern about the questioning of election legitimacy. In contrast, concerns about civil violence have declined since August (when Charlottesville occurred) and concerns about civil liberties have declined since October. When asked to identify the most threatening recent event (if any), the most common response was the president’s warnings on the media, especially the threat to revoke licenses for unfriendly press coverage. About 30% of respondents referenced this in some way. Other frequent responses were potential voter suppression and anti-democratic by the president. How does the U.S. compare to other countries on the same questions? The above figure shows the average threat rating across the six categories for each country. Countries fall in three groups: the United Kingdom and Canada face the lowest threat level; the U.S. fits in a middle group with Poland and India; and Hungary faces the greatest threat. As of November, the U.S. rates worse than India and Poland. This comparison helps to validate the survey questions—not all democracy experts rate their country of expertise as being threatened or outside the norm, even in a Conservative-led UK. Rather, the U.S. jumps out as distinct from other consolidated democracies. 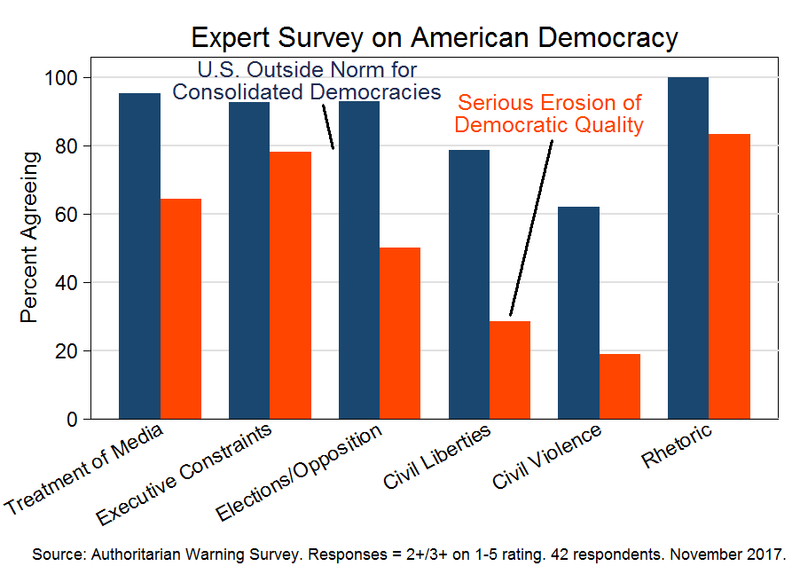 The third figure shows the percentage who rated each category 2 or above (indicating behavior atypical of a consolidated democracy) and 3 or above (indicating erosion and future breakdown threat). Worryingly, majorities rate the U.S. as outside of the norm for stable democracies on every dimension. This is the fourth time this is true for civil violence. Nearly all rate rhetoric, executive constraints, elections, and treatment of media as outside the norm. November is the first time that a category besides rhetoric has a majority rating a 3 or above, which is true of media treatment and executive constraints. In general, respondents were cautious about assigning high values—only 1 response (0.4% of total) registered the highest threat category of 5. This reassures us that respondents are not amplifying their answers for effect. We also asked respondents whether democratic stability and quality has improved or declined over the last 10 years (chosen so the reference point is another Republican president). 85.7% responded that American democracy has declined, with 35.7% saying it’s “much worse.” No respondents said it has improved. Finally, we directly asked respondents about the likelihood of democratic breakdown (by their definition) within the next four years. Note that “breakdown” does not imply full dictatorship, only a sufficient erosion of democratic functioning. The responses averaged an alarming 10.5%, with a median of 8%. Responses ranged from a low of 0 (given by four respondents) to a high of 50%, with seven answering 20% or higher. Note that 10.5% is orders of magnitude higher than what traditional models of democratic breakdown would predict for the U.S. given its stability and socioeconomic advantages. The results give us clear reason to be concerned about the future of American democracy. November saw an increase in threat levels across all categories but civil liberties, with the greatest increase on treatment of the media and executive constraints. There is a near-consensus that American democracy has weakened over the last 10 years and is now outside the norm for consolidated democracies, especially in rhetoric, media freedom, and executive constraints. As discussed earlier, one should not view rhetoric being the highest-threat category positively since rhetoric can erode the norms holding democratic compacts together and often predicts later anti-democratic behavior. Indeed, the estimated 10.5% chance of democratic breakdown (within four years) is a major warning sign. However, the most likely downward path for American democracy remains the steady erosion of democratic norms and practices, as followed before by Venezuela, Hungary, Turkey, and many others. This presents threats that extend beyond the current administration and may imperil American democracy for years to come.